Toronto's Little Foot Long Foot have always been a good blues rock band. On their new album they take another huge step forward. The album, Oh, Hell (out June 28th), is the first one with Caitlin Dacey (Bella Clava) as a member, providing keyboards and vocals. The move to a trio pays almost instant dividends. The benefits are obvious with the album opener "Nothing". The double-barreled vocals are an extremely powerful device. 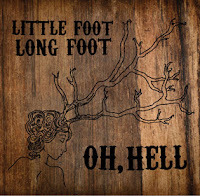 Little Foot Long Foot have always done the blues rock thing extremely well, and with tracks like the visceral "Neko Case Hate Fucks Kurt Cobain", that's no different this time around. What is different is the unmistakable country influence that's seeping in. Sometimes, as on "Fugato", that only manifests in a slight vocal drawl. Other times, like on the hook-laden "May" and clever "Missing The Point", it's a delicious full out blues-country-rock concoction. The band even touch on classic rock on "Kickface". That track does exactly what it's name suggests, opening with a Sabbath-style guitar riff and finishing up with a Doors-esque organ breakdown. There's not a lot of room for nuance amidst the bombast, but producer Ian Blurton has done a magnificent job in allowing the group's character and soul to cut through the intimidating wall of noise. Little Foot Long Foot were a duo that really didn't need to change anything up in order to keep creating great music. They rolled the dice by making a radical change in their line-up, and it has paid off. Oh, Hell is a keeper. 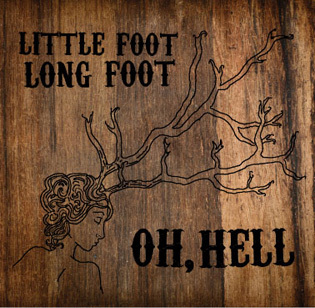 Little Foot Long Foot play a CD release show at the Silver Dollar in Toronto on June 4th.